A uniformed, utopian battalion of minimalist man-droids – Telfar’s 10th anniversary sees a design rework of the brand’s own signature details for AW15. 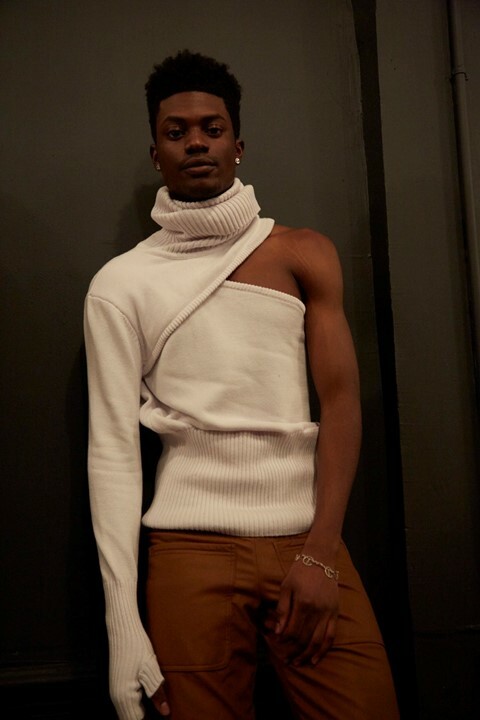 This season, Telfar Clemens heightened the theme of originality bordering on self-reference, by looking back on the last 10 years – taking inspiration from his past collections to create a 2K15 remix. “The title of the collection is TELFAR, and it’s built around everything the brand stands for – everything is unmistakably my design,” the designer explained. Every silhouette and detail had that uncanny signature Telfar look – a minimalist, unhinged utilitarianism the designer has faithfully developed over the past decade. “I focused on fusing different details from old collections together; re-appropriating and redefining them. For example a pocket from 2005 is now part of a trouser I designed in 2010.” Striking tonal colour blocks of “futuristic, 70s Levi’s blue” and “Carhartt brown” corduroy echoed a bygone age of industrial American workers in uniform – and yet, simultaneously persisted in bringing it into “the 20-teens, our actual reality,” by blurring the boundaries between male and female, normative and avant-garde. This season, Telfar again forwent the obligatory thump of runway music in favour of a sound piece, made in collaboration with musician Lizzi Bougatsos of Gang Gang Dance. Magical electronic glimmers and iPhone whistle notifications gave way to gunshots and the thunder of war, models triggering samples as they walked – creating a living sonic environment.